Why work when you can automate? The Mi Smart Home kit has everything you need to get started with home automation. Alongside phones, robot vacuums, smart lights, and rice cookers, Xiaomi also makes home automation products. As is the case with the manufacturer's other offerings, one of the main advantages with Xiaomi's $75 Mi Smart Home automation kit is that it is inherently affordable. The kit comes with six components — a gateway that acts as a central hub, a smart wall plug, door and window sensor, motion sensor, temperature and humidity sensor, and a wireless switch. Everything is configured and controlled through the Mi Home app which requires you to set up a free Mi account to get started. As the Mi Smart Home Kit is officially limited to Xiaomi's home market, you'll have to set China as the locale in the Mi Home app to add all the products and configure them. The device pages and all the instructions are in English, but Xiaomi's storefront within the app defaults to Mandarin. Thankfully, you won't need to bother with the store to use the products in the Mi Smart Home kit. With that out of the way, let's take a look at the individual components. The gateway is a Zigbee-powered hub that connects all of Xiaomi's smart home products, featuring a built-in speaker and an RGB LED that doubles up as a night light. The gateway features a standard Chinese three-prong plug that needs to be connected to a wall socket or a surge protector. It is rated for 100V-240V, so if you're looking to use it in the U.S., you would be able to plug it in directly provided you have a compatible socket. If not, you can pick one up for as low as $7. Once plugged in, you need to use the Mi Home app to set it up. All of Xiaomi's products are very straightforward to set up, and the Mi Smart Home gateway is no different. Once you plug the gateway into the socket ensure your phone is connected to your Wi-Fi network and sign in to your Mi account in the Mi Home app. Then simply press down on the power button located at the top of the gateway for three seconds, and the app will automatically detect the new device. If the gateway emits a solid blue light, you've managed to pair it successfully with the Mi Home app. After installing the gateway you're able to listen to internet radio via the built-in speaker (though you'll only be able to access Chinese stations unless you do some tweaking) and also change the color and brightness of the LED from within the Mi Home app. Installing the other Mi Home components is simple. 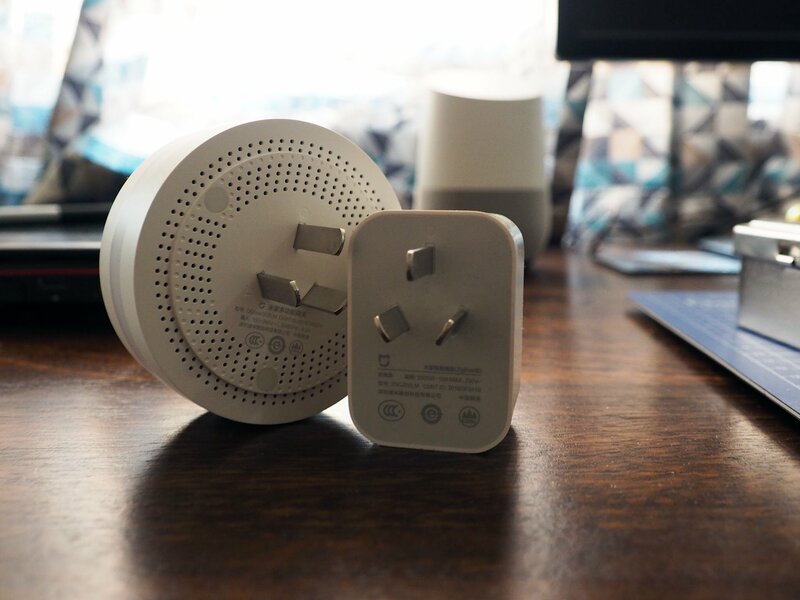 All sub-devices have a pinhole that allows you to easily reset them by holding them in for three seconds; the gateway should automatically detect the sub-devices soon after they're reset. Pairing a component — like the motion sensor or the door sensor — takes under 30 seconds, and once it's connected to the gateway, you'll be able to set actions for it from within the Mi Home app. Xiaomi's motion sensor is amazing. At 3cm tall, it's tiny, but it does a great job of detecting motion in its immediate vicinity — up to 1.5 meters. You can pair it with the gateway by resetting the device (via a SIM card ejector tool in the pinhole) and connecting it to Mi Home. Once it's paired, you can configure a series of actions for the sensor, such as turning on the lights, Xiaomi's air purifier, or control any of the manufacturer's connected products. You have the ability to create custom scenes, and even set a specific time for an event to run. For instance, you can configure the motion sensor to turn on the lights if it detects activity after 6 p.m., or set up a scene to turn off the lights once you walk past the sensor in the morning. There's also the option to send a notification to your phone each time the sensor is triggered. As the name suggests, the door sensor connects to a door, and can be used as an alarm system. You can configure it to trigger an alarm and send you a notification if it detects activity when you're outside your home. The window sensor offers a similar feature-set, but it's smaller and has a magnetic base that easily hooks onto a windowsill. The temperature and humidity sensor is the one I rely on the most. It is also the easiest to use. Just pair it with the gateway, stick it on a wall or on a surface, and use the Mi Home app to see the temperature and humidity in that room. The sensor shows real-time temperature and humidity data, and also offers a chart breaking down the daily and weekly trends. If you're living in a particularly hot or humid location, the sensor makes a lot of difference. As the name suggests, the wireless switch is a programmable button that gives you fine-grained control over a component. If you have Xiaomi's Wi-Fi connected Yeelight bulbs, you can use the wireless switch to turn them on and off. You can do the same with the $30 Yeelight light strip. Should you have several bulbs around the house, you can create a zone in the Mi Home app, and then configure an action for the wireless switch. For instance, I have two lightstrips in my office, and I paired them together so they're the same hue at all times. I then programmed a switch to turn the lightstrips on and off with a single press. Along with a single click action, the wireless switch allows you to set customize actions for double clicks and long presses. The Mi Home app offers a myriad of configuration options for the wireless switch provided you've already invested in Xiaomi's hardware. There are options to switch the operating mode for the Mi Air Purifier, control the smart home gateway's internet radio, toggle the company's smart plug, and so much more. Overall, the Mi Smart Home offers a ton of functionality for its $80 retail price. The best part about the system is that once you have the gateway up and running, you can install as many sensors as you want, with each sensor costing anywhere between $5 to $15. The downside is that there's no IFTTT connectivity, but for now, the Mi Home app offers more than enough configuration options. For its customizability, feature-set, and sheer affordability, the Mi Smart Home kit is an enticing option if you're looking to get started with home automation.